A very lucky week for Steve! Do you remember the saying that things always come in threes? Well, I really should buy a lottery ticket. Instead the numbers I would have picked had I bought a ticket for Saturday will be 7,11,32, 40,48,49. Why do I tell you this? Well I believe the odds of me winning the lottery are so far stacked against me I’m not going to spend the money on a ticket. However, I have just won TWO competition prizes. Yes, TWO! Maybe the lottery could be the third…. Oh, hang on, I’ve had THREE prizes this year now, I never got round to blogging about the first. So, here they are in order. I won an iPod Touch back in May. This is the second iPod I’ve won, the iPod shuffle came from Ford in 2006. The iPod Touch was won in April after I replied to a survey on out-law.com. 16Gb of music player worth around 200 promptly borrowed on a long term basis by my wife. 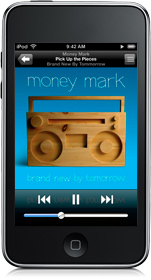 Well, I wouldn’t use a music player much but it did reveal to me the clever touches an iPhone would have. I can’t have an iPhone because it isn’t as flexible as I need it to be as a PDA organiser and phone – the touch cruise is still a better option for me. However the safari web browser it has built in outperforms Internet Explorer mobile version and Opera mobile so if it weren’t for the application flexibility I like I’d probably be on an iPhone already. Out-law.com is an online legal magazine that reviews ongoing, erm, legal things. I find it well written, informative, impartial and it’s one of the few RSS feeds I have set on my phone. Last week a ‘signed for’ package arrived in the post. In it was a prize courtesy MXR Digital. There was a competition in a trade magazine which, for some reason, I decided to enter. 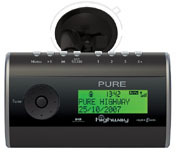 I must have had a lucky feeling because I won a Pure Highway DAB Digital Radio for the car. Looking at the prices online, they’re around 70. I wouldn’t choose to buy one though on long journeys I do occasionally wish for some different radio entertainment. However, now I have it I can’t wait to find time to put it together and play with it. It transmits to the car through an FM transmitter built in or through a cable you can plug it into. Hopefully I’ll have some free time in the next week or two to try it out and report back. The third prize is a lot more special than this little picture shows. I’ll be telling you all the amazing technical features later when I get to play with it, once it arrives. Today, I got a phone call from the magazine and email from the supplying company to say I’ve won a flat screen, 23″ TV. This, however, is no ordinary flat screen TV. It’s a Bath-o-vision 23″ wall mounted, mirror fronted flat screen TV worth around 1,800. Excuse me while I pick myself up off the floor. How on earth can you justify that for a TV? Well, this TV is designed to go in a bathroom, or swimming pool. When turned off it looks like a normal mirror. When turned on, you get to have a decent size TV with a wide viewing angle (178 degrees! ), HD Resolution and a built in digital TV tuner. This is not the kind of TV you’ll buy in the supermarket! It’ll be a month or so before this prize arrives, the company are organising for the magazine to visit for photos of them presenting the screen to me.